Near-sighted paper celebrates dumpster diving outside NYU dorms. Oh, New York Times! The New York Times is fickle. In the last year, they’ve scared the pants off of New Yorkers by publishing scary articles about how bed bugs were spreading around the city and what you need to do if you find them. 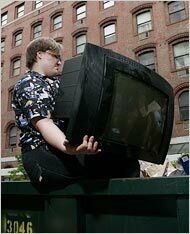 So imagine my surprise to find that yesterday, Steven Kuritz published an article in the NY Times entitled “Not Buying It,” which celebrates the free-cycling frenzy out of the NYU dumpsters at the end of the semester. The article focuses both on this specific dumpster diving party, as well as a movement called “freeganism,” where people turn their backs on our consumerist society, recycle, and get things for free. Darcie Elia, a 17-year-old high school student with a half-shaved head, was clearly pleased with a modest haul of what she called “random housing stuff” a desk lamp, a dish rack, Swiffer dusters — which she spread on the sidewalk, drawing quizzical stares from passers-by. Ms. Elia was not alone in appreciating the little things. “The small thrills are when you see the contents of someone’s desk and find a book of stamps,” said Ms. Kalish, 44, as she stood knee deep in the trash bin examining a plastic toiletries holder. 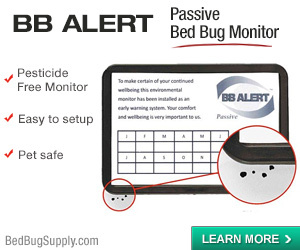 This would all be great except for the bed bug factor. The site (freegan.info), which provides information and listings for the small but growing subculture of anticonsumerists who call themselves “freegans” — the term derives from vegans, the vegetarians who forsake all animal products, as many freegans also do — is the closest thing their movement has to an official voice. And for those like Ms. Elia and Ms. Kalish, it serves as a guide to negotiating life, and making a home, in a world they see as hostile to their values. They dress in castoff clothes and furnish their homes with items found on the street; at freecycle.org, where users post unwanted items; and at so-called freemeets, flea markets where no money is exchanged. Some claim to hold themselves to rigorous standards. “If a person chooses to live an ethical lifestyle it’s not enough to be vegan, they need to absent themselves from capitalism,” said Adam Weissman, 29, who started freegan.info four years ago and is the movement’s de facto spokesman. There are freegans all over the world, in countries as far afield as Sweden, Brazil, South Korea, Estonia and England (where much has been made of what The Sun recently called the “wacky new food craze” of trash-bin eating), and across the United States as well . Arrrggghhhhh! Trash tours!!! 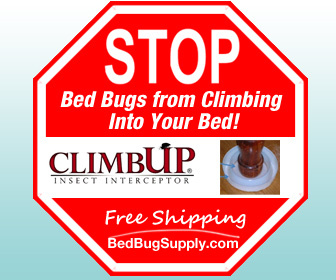 I wonder how many people have picked up bed bugs this way. The food stuff really is not freaking me out. People have been doing that forever. But the act of standing in the dumpster is a dodgy one, and also much of this stuff — pillows, clothes, TVs, furniture — has got to be infested with bed bugs. A year and a half ago, I would have been cheering too. Recycling, or free-cycling, if you will, is so green! But lots of people in New York have bed bugs. Way more than you hear about. And I hear about a lot of them, every week. I’ve even heard of some in the vicinity of NYU. And why would that surprise you, since college dorms and residences around the country (and beyond) are becoming infested. 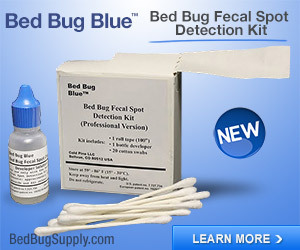 Would it be possible that NYU had lots of bed bugs, since it is not only a college, but located in a very infested region? Quite possibly. Dumpster diving, anywhere, is not such a hot idea. And if you find good stuff, I mean stuff that looks great–TVs! iPods! Really clean-looking mattresses! Be wary. Sure, NYU students may have a lot of disposable income. But who throws away a working iPod?!? Who doesn’t have the space to carry an iPod? Think about it. What’s greener than dumpster diving? 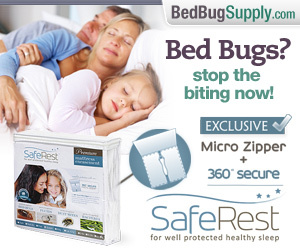 Let me tell you: not getting bed bugs. 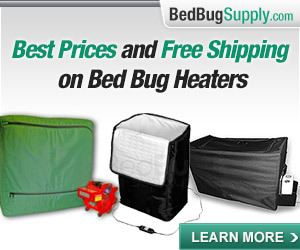 Because getting bed bugs is the least “green” thing you can do. You’ll rue the plastic garbage bags and XL ziplocs and gallon ziplocs and pest control operators with sprays containing who-knows-what. And the repeat visits from the PCO, and the extra laundry, and the extra laundry, and the extra laundry. And if something should be too infested to treat: the destruction, the replacement, and so on. Getting bed bugs is the one of the least green things you could do this year, and it’s probably one of the most expensive surprises you can have, save losing your job. Insurance does not cover you. Dumpster diving in bed bug city is not thrifty nor green. Things ain’t always what they seem. I’d love to see people in hazmat gear carefully combing through the dumpster contents, isolating possible “good finds”. Inspecting them carefully, really carefully, taking them off somewhere, maybe even for treatment, and re-selling the stuff to people who care about the environment and have money to burn. It could even be done for charity–maybe to help others who need furniture and can’t afford it. Whether your motivation is saving money, or saving the planet, or both, spreading bed bugs is going to sabotage your plans. If you want to love the environment, as I do, and say no to capitalism, then do your best to educate yourself and others about bed bugs. And avoid them like the plague that they are. Well said NB (though I wouldn’t approve of this behavior pre-1998 either, and the scavenged food seriously grosses me out). It’s just so typical of the New York Times to glorify this harmful lifestyle. If these people want to put themselves at risk, fine, but what about their neighbors? I’m so glad I no longer subscribe to this irresponsible newspaper. PS: Just a quick warning to everyone — much of the merchandise sold on New York City sidewalks comes from dumpster diving (especially books). Do not buy any of that stuff. HI James, thanks for the message! I do think taking an item off the curb in the pre-bed bug days was not so dangeorus (nor were yard sales and secondhand stores). Standing in an actual dumpster is another thing. These days I wouldn’t trust anything. And yes–you are totally right, sidewalk stuff is trash-picked. Caveat itcher! 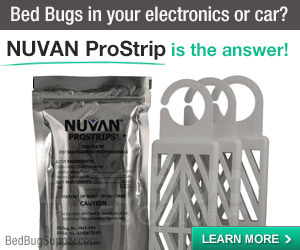 Nobugs–This would be a fabulous op-ed piece or column feature for the Times. Re-write it for that purpose and submit it! If not, at least send a sharp letter to the editor. I doubt the New York Times will publish an op-ed piece or even a letter anonymously. I’ll post more on this irresponsible article later tonight. Apparently lots of people outside of this blog also think that dumpster diving and garbage picking is a bad idea for precisely the same reasons we do. People who haven’t had bed bugs. Word is spreading. Glad it’s not just us. FYI freeganism was the feature on Oprah today. I’m sorry but after going what we went through to rid these things, seeing that other bedbuggers were reaching out to her to try and air something on the importance of not spreading bed bugs….and then seeing THAT air on her show!!! It just really pissed me off. So now how many thousands more will be becoming these “freegan people” and spreading the wealth (or should I say what turns to poverty) of bed bugs. And I am all for less consumerism. But those who’ve encountered bed bugs know how much money, energy, pesticides and (dare I say it) WASTE is involved in treating bed bugs, and this is something freegans need to be warned about. Honestly, I think it depends on the type of item. Many items, such as clothing, can be brought into the house in a plastic bag and immediately thrown in the washer and dryer as soon as you bring them into the house. Also, if you aren’t literally dumpster diving but are instead using a service such as Freecycle, you can hope that people who know that they have infestations aren’t passing on their stuff. I may be biased because I grew up in an extremely poor family and almost everything I owned growing up was picked out of the dumpster or bought at a thrift store. If you clean things when you bring them into the house it is usually fine. 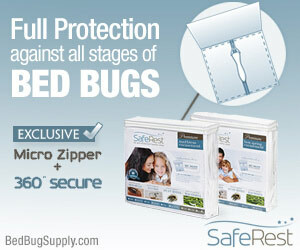 Unless you are VERY young, you grew up in a time and place where bed bugs were almost unheard of. I grew up with secondhand stuff and thrift stores too, but bed bugs were not the danger then that they are now. 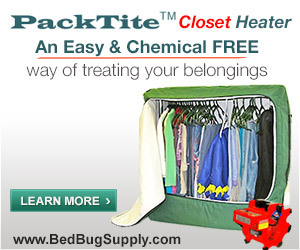 Believe me, bed bugs are circulating via freecycle and Craigslist, as well as other secondhand sources. Entomologist Michael Potter tells us up to 50% of people don’t react to bed bug bites and so may have no idea they are infested. Still more will be infested for a time and passing things on long before they notice the problem. Yes, keeping stuff isolated then washing / drying on hot is fine, but you should realize MOST people do not know to do this. That’s what we’re up against. Ms. Kalish, one of the freegan advocates, is my Spanish teacher and you’d be surprised to know how much I learn about freeganism in her class everyday. Not that our Spanish lessons are centered on freegan activities, but her little stories of dumpster diving, recycling, and endless methods of conserving materials have really made me respect freegans. These people do what they do not because they aren’t able to do any better for themselves but because the capitalist society we live in is so very wasteful and inconsiderate of the environment. I probably could not find enough courage to do half of what my Spanish teacher does, but this Friday I am goin dumpster diving at NYU! I hope to have fun and enjoy what little part of me will allow me to be a freegan for a day. And about bed bugs.. they don’t all come from dumpsters.. Does not the increase in bed bugs actually show how dirty we New Yorkers actually are? 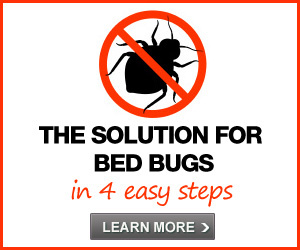 If we washed more carefully and maybe cleaned our mattresses once in a while we probably would not have bed bugs.. I guess it’s just our way to blame everything on everyone else. Also, I say the person who wrote this article is a bit underqualified for the job… “Arrrggghhhhh! Trash tours!! !” How did you get hired with such bad syntax? Oh Jenny, Jenny, Jenny. That comment about my writing style was not very nice. 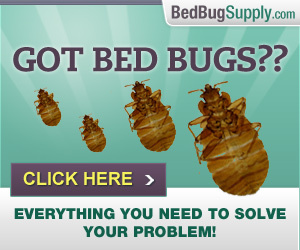 But the comments implying people with bed bugs are responsible for their problems is just plain ignorant. 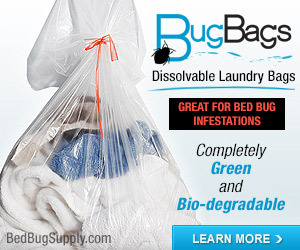 I really hope you don’t get bed bugs, because then you might discover they have nothing to do with cleanliness. They are an easily transmitted pest, and the nymphs are 1 mm long. Do you know how small that is? Would you know if one crawled up your leg while you were standing in a dumpster? I think it is possible to try and defend freeganism, but you’re actually showing your lack of knowledge about bed bugs. 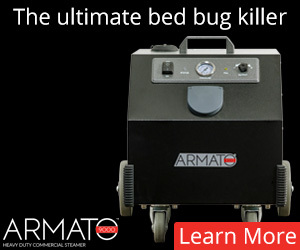 And that’s why the site exists, after all, to share knowledge about bed bugs. They are easily spread. NYU is in an area with many reports of bed bugs. 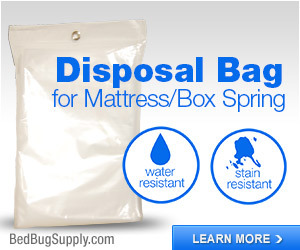 Lots of people who get bed bugs don’t realize that tossing out everything they own isn’t necessary. And the bottom line is, one way to really waste a lot of your money, and mess up the environment, is to fight a prolonged battle with bed bugs. Do Jenny’s parents know what Ms Kalish is teaching? Yikes! Jenny, most of the world’s environmental problems are caused by inadequate regulation. Rather than go dumpster diving and risk getting bed bugs, I suggest you spend your time writing to your elected representatives. After college, you can even work for one and eventually run for office. Huh. Before bed bugs anyone who entered my home were totally amazed on how clean it was. You could literly eat off the floor at any given day (not that some one would) Religiously I would vacuum my mattress every four weeks.In fact I used to vacuum my living room furniture weekly. 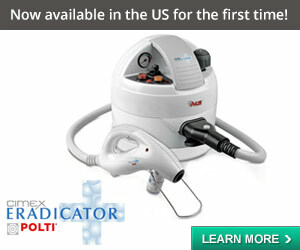 We had bed bugs, we had them bad, we did not know for a long time. So is some one supposed to turn over all huge items such as sofas and beds on a weekly basis, vacuum cracks and screws to stay bug free?! That my friend is near impossible to do for any prolonged period of time. Funny enough, now after bed bugs, I clean regularly, but not as I used to. 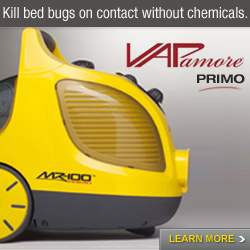 I don’t vacuum my mattress at all in fear that there may be bugs that I will disturb and spread in the home. I used to feel gratification in cleaning, now I continue to do so, but in fear. So Jenny, that is what these bugs do, even to the most cleanest of homes.